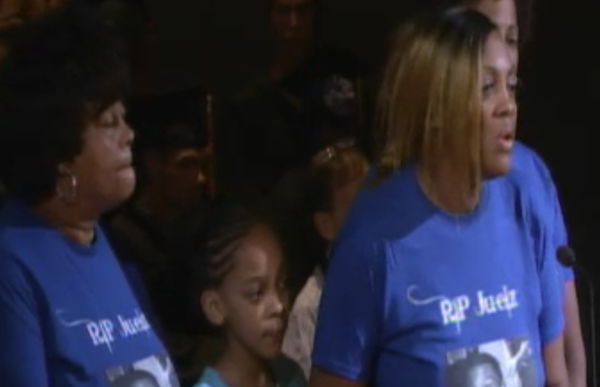 LaTisha Nixon, right, with her daughter and mother speaking before the West Hollywood City Council. The mother of the young African-American man found dead of a drug overdose in the apartment of prominent white political donor Ed Buck stood before the West Hollywood City Council tonight to ask that other young men who had evidence about Buck be granted immunity from prosecution so they could present that evidence to the L.A. County Sheriff’s Department. LaTisha Nixon made the request in a speech before the West Hollywood City Council that attracted coverage from local television stations. She was accompanied by members of her family and African-American activists. 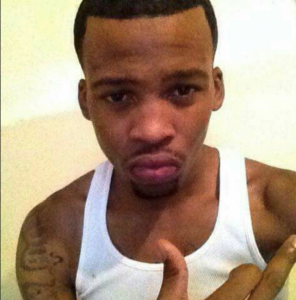 Nixon’s son, Gemmel Moore, 26, was found dead on July 27 in Buck’s apartment on Laurel Avenue. The L.A. County Coroner’s Office ruled the death an accident and attributed it to Moore’s use of methamphetamine. The L.A. Sheriff’s Department announced recently that its Homicide Division has opened an investigation into the circumstances around Moore’s death. While the City Council has no authority to grant immunity from prosecution, several of its members supported Nixon’s request. Councilmember John Duran, however, noted that such grants are complicated. For one thing, the Sheriff’s Department doesn’t have the authority to grant immunity from prosecution to witnesses. Whether to grant such immunity is decided by the L.A. County District Attorney’s office. Anyone testifying without that immunity could be prosecuted for prostitution or drug dealing. Jasmyne Cannick, a black communications and public affairs strategist, has published allegations about Buck from other unnamed young men, with photos, online. Cannick earlier had published photos of pages from the journal of Gemmel Moore in which he wrote about his relationship with buck. Mayor John Heilman and council members Lauren Meister and John D’Amico also voiced their support for Nixon and her family. “I appreciate her efforts in speaking plainly to us and asking for help,” D’Amico said. D’Amico acknowledged that many residents drink and do drugs for “fun and to enjoy themselves” but lamented that some become addicted. Council members have been criticized by some black activists for not haven spoken out earlier for an investigation into Moore’s death. In her criticism, Ashlee Marie Preston, a transgender African American activist who is editor of “Wear Your Voice,” an online magazine, has noted that Buck was donor to the election campaigns of some council members. Buck gave the maximum personal donation of $500 in 2011 and 2014 to John D’Amico’s election campaign. He also gave that maximum donation to Duran in 2012. 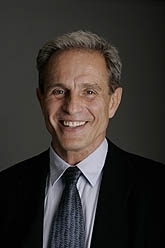 Buck was an organizer of a campaign to ban the sale of fur garments and accessories in West Hollywood and rallied fur ban activists to support D’Amico, who pushed through the ban in 2011 after he was first elected to office. Buck has not responded to requests for comment about circumstances surrounding Moore’s death. His lawyer, Seymour Amster, has said that Buck had nothing to do with Moore’s death. What a great tragedy for this family, losing their son in such a horrific public way. I can’t help but wonder if they could have saved Gemmel’s life, had they given the effort that they are giving now in search of “justice”, if there can be any such thing here. No surprise that CC members Duran & Horvath have jumped into the mix, seeking personal attention as usual. Duran especially would be wise to heed the superior legal advice he was offered & “button up”. Neither Duran or Horvath offered a single word of sympathy to the family of John Winkler who was shot & killed for no reason by a careless W.H. Deputy. They speak up now for self serving reasons & that’s a part of this tragedy that’s been turned into an on going soap opera. “Opened his home to an individual who was troubled? ” What planet do you live on? Isn’t that blaming the victim a little bit? This sounds eerily like the Bill Cosby of the animal rights community.